Lake in Zell am See, Austria. The city of Zell am See, Austria is best known in the country and among international travelers for its resorts. A tunnel provides easy access to the region for travelers who would like to take a break from the larger nearby city of Salzburg. Its lakeside location offers a great selection of outdoor activities in the region for tourists who enjoy visiting regardless of the season. Winter brings abundant snow to cover the nearby peaks and valleys. This season makes the town an ideal spot to indulge in sports such as skiing, snowboarding, tobogganing and snow kiting. Springtime makes the surrounding mountainsides bloom with plants that are uniquely Alpine. Visitors can indulge in the therapeutic services and ambiance of health spas that are present around the town. Summer leads to plenty of opportunities for outdoor sports that include horseback riding, and mountain climbing. 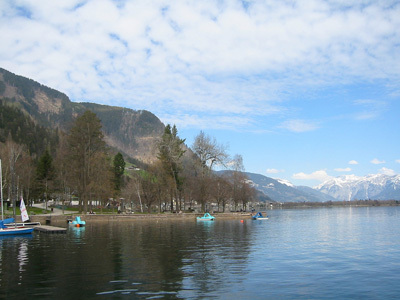 They can also enjoy swimming in the surrounding bodies of water such as the Salaach River, Zeller Lake and Salzach River. Autumn is perfect for outdoor concerts, festivals, and last minute explorations of nearby natural reserves before the cycle of fun repeats itself all over again at the start of next winter. The center of Zell am See, Austria is also distinctive for its quintessentially Medieval atmosphere. This is not too surprising since monks from Salzburg founded the town in 740 AD. This rustic and tranquil atmosphere makes the center popular to visitors who constantly fill the town’s lodging houses to almost full capacity. Another testament to the area’s historical heritage is the Saint Hippolyte Cathedral. Three architectural movements blend together to adorn the exteriors and interiors of this particular church. The main structure was constructed according to the Romanesque style. The main altar and some statues were influenced by the Baroque movement of the 1600s. Currently, Gothic styles predominate the church, particularly the aisles, baldachins, and parapets. A rich history amidst the uniquely Alpine landscape combined with modern facilities and activities – Zell am See, Austria is certainly more than a resort town that tourists from all parts of the world can enjoy.